Multiple Edgar and Gold Dagger award winner Rendell displays her mastery of spine-tingling suspense in her first short story collection since Blood Lines (1996). In the scary title tale, a solitary, arrogant, self-appointed fault-finder is haunted by memories of his dead mother. 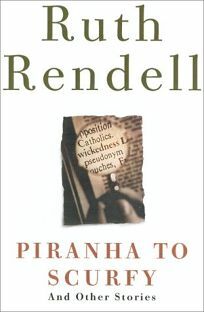 Although the twist is soon obvious, Rendell adds a dimension that holds the reader to the end. Mythology and fairy tales come to life in ""High Mysterious Union,"" a novella in which a man's increasing obsession with a young woman places him under a spell that almost leads to his death. Irony plays a strong role in most of the nine tales here. In ""Walter's Leg,"" the title character learns that people don't change, even over a lifetime. ""The Professional"" is about a young man who thinks he witnesses a murder, talks himself out of it, then too late realizes he was right. In ""Fair Exchange,"" a man's doubts about a healer who helps his sick wife are his undoing. Rendell is such a good writer that all these subtle and witty stories succeed, but they are superficial compared to her far more complex and satisfying novels. (Jan. 30) Forecast: Rendell is a fine stylist with an imagination that should appeal to readers of ""literary"" fiction as well as to mystery fans. Although her novels far outshine these short stories in depth of plot and characterization, this collection could introduce some nongenre readers to her work, especially to the tales of psychological suspense she writes under her own name and as Barbara Vine.